Typical administrative assistant interview questions with expert practical interview answer help. Administration support and administrative assistance are core to the efficient operation of a department or company. Office administrative jobs are one of the most commonly listed job opportunities on the job market. Jobs in the administration sector require a wide range of skills and abilities. These interview questions for administrative assistant jobs explore the 9 key skills and competencies required for success in the role. The interview answer guidelines will help you to prepare for success in your administrative job interview. Briefly describe your administrative experience. What do you consider your administrative strengths? How does your previous experience make you a suitable candidate for this job? When describing your past experience focus on the aspects that directly apply to the job you are interviewing for. Consider the needs of the organization and relate your skills and abilities to these. Carefully study the job description or posting to determine what the employer is looking for and outline how your previous work experience has equipped you for this job. Communication is key to any job that provides support and assistance in an organization. Your answers should clearly demonstrate your ability to express yourself effectively both verbally and in writing as well as your ability to listen actively and understand the communication taking place. Tell me about a meeting you recently arranged. How did you coordinate and schedule it? Focus on scheduling and prioritizing activities. How do you decide which are the most important activities? Include criteria such as urgency of the tasks, deadlines to be met, available resources and setting realistic targets. Outline the tools you use to plan your day including the computer applications you have found helpful. How do you go about getting the relevant information necessary to understand a problem in order to be able to decide on a possible solution? Highlight how you collected all the necessary information to determine the cause of the problem and how you used the available resources to resolve it. What different systems have you used to store information and documents? What record keeping were you responsible for? what sort of data were you responsible for processing? Administrative assistant interview questions will explore your ability to gather and manage information. Detail the types and volume of data you had to manage and how you ensured your information management was up to date and accurate. Describe a situation where you were able to help out a colleague or team member. Administrative assistants have to work effectively as part of a team or group. Your answers should highlight your ability to build relationships with other group members and show how you contribute to team success. Tell me about a time you had to deal with a very demanding customer. How did you handle it? Describe a situation where you went out of your way to provide customer satisfaction. Remember when answering administrative assistant interview questions about customer service that your colleagues, supervisors and managers are your internal customers in addition to any external customers that you have to deal with. In your interview answer focus on the following: - asking the right questions in order to clarify the customer's wants and needs - using your knowledge and skills to determine how to meet those needs. Describe how you went about providing the right service to meet the customer's needs. Can you tell me about a challenge you faced when dealing with colleagues from diverse backgrounds, how did you handle it? Tell me about a time when you had to adapt quickly to a new procedure or policy. An administrative assistant has to provide support to a number of different people under a number of different circumstances. Your ability to adjust successfully to different individuals and task requirements is very important. Provide specific examples of when you had to adjust your approach and behavior in different situations. Attending to and completing all the details results in accuracy. Give examples of when you have addressed mistakes in your or other people's work. Focus on following the correct procedures to complete a task and check your work. What skills and qualities are most important in an administrative assistant? 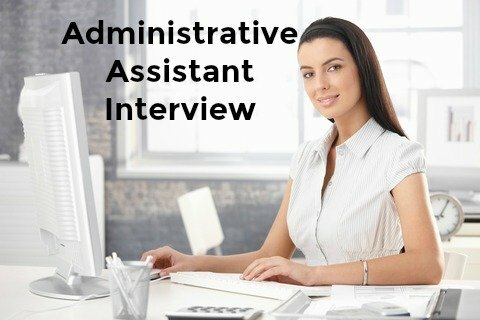 It is important to have a full understanding of the role of the administrative assistant in an organization in order to answer this interview question competently. These job descriptions list the duties, responsibilities and skills for the administrative assistant position. Use the Administrative Assistant Job Description to help you answer administrative assistant interview questions. View the Administrative Assistant Duties that apply to administrative assistants in different environments and departments including sales, marketing, medical and human resources. Administrative functions are wide-ranging. These related job interview pages will help you get the administrative job you want. Expect some tough questions in your job interview about reason for leaving, gaps in employment and salary. Use these sample Job Interview Answers to handle these difficult questions with confidence. It is important to have a list of smart questions to ask in your interview. Asking insightful questions indicates a strong level of interest in the job and demonstrates that you have spent sufficient time thinking about the job opportunity. What will be the recruit's main focus in this job for the first couple of months? Can you describe the immediate challenges in this position? What are the essential qualities of a successful employee in this department? What sort of management style can a new employee expect? Administrative Assistant Interview Questions to ask the interviewer about the job opportunity and the company.